A beautiful sight. 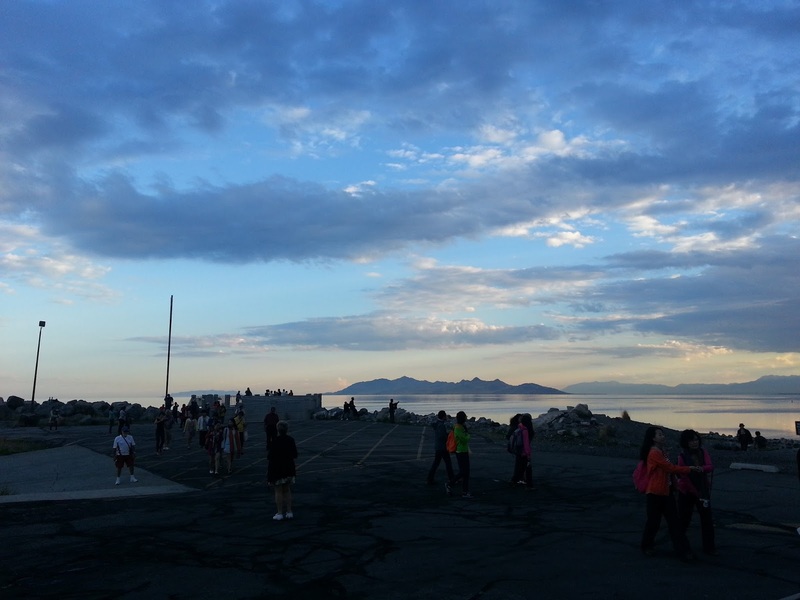 Looking east from the Great Salt Lake Marina. Looking at my calendar last night, I realized that this coming Saturday is my last shot this year for completing the Utah Triple Crown. I did Bear Lake in July and Deer Creek in August, but I still need to do Antelope Island to Black Rock at the Great Salt Lake. I've been avoiding the GSL during the hot summer months because the water it too warm and there are too many bugs. This morning I went out to the marina to see what the water was like. Walking down to the boat ramp I saw a cloud of bugs and thought "oh great". The water level was pretty low and there was some scummy stuff near the shore. I figured it would be better out in the open lake, so I dropped my thermometer in and headed out. There were some bugs on the surface of the water in the marina, but nothing too bad. There were also some pretty cold spots inside the marina. Once I got out into the open lake, things got 100 times better. The water was perfectly flat and glassy and the reflection of the rising sun made the water look pink. There were no bugs and the water temperature was significantly warmer, I'm guessing at least 74 degrees. I was really encouraged and excited and started out for the first buoy. I ended up following the red buoys, counting my strokes, for half a mile. I stopped part way through just to enjoy being in the water and watch the sun coming up. After half a mile, I turned around and headed back. This photo doesn't really capture how many tourists were there this morning. Eight tour buses! The water temp dropped again when I got back into the marina. When I lifted my head to sight, I saw a MASSIVE crowd of people milling around the boat ramp. As I got closer, I could see several tour buses. I collected my thermometer (which showed 70 degrees) and headed to the hose to rinse off. The hose was being used by a couple tour bus drivers to wash their buses so I had to hang around in my speedo in a crowd of tourists until it was free. A few people came up and asked about swimming in the lake. After rinsing off I hopped in my car to leave. I counted eight tour buses on the way out! I've never seen that many buses or tourists there before. The visitors center and gift shop are now open and I wanted to go in and check it out, but I'll wait until I have more time. 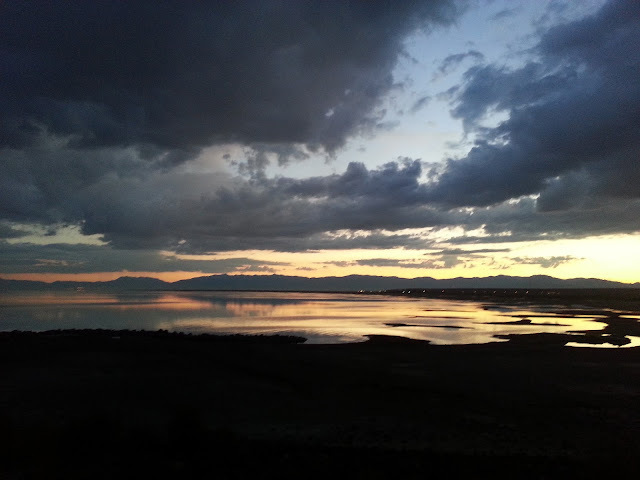 This morning I am going to try to get a hold of Dave Shearer, Harbormaster at the GSL Marina, to see if he can take me and a paddler to Antelope Island on Saturday morning so that I can finish the Utah Triple Crown. I'm also looking for a paddler if anyone is interested. It should take me about four hours to finish and I'll buy you lunch afterwards.